The aim of this study was based on experimental infection via the pathogenic injections and natural infections by Yellow-head Virus (YHV). Whiteleg shrimp (Litopenaeus vannamei) were experimentally infected with YHV by either injection or co-habitation with YHV-injected shrimp. Thereafter, YHV load, L. vannamei Toll (LvToll) mRNA and LvToll protein level in gills of moribund and survived shrimp from both groups were determined. All shrimp of the YHV-injected group died within 3 days post-injection and 80% of co-habitation group died within 14 days, with 20% surviving to day 30. Moribund and survived shrimp gills were isolated and analyzed to determine YHV load and LvToll expression. Tissue was also assessed to determine LvToll protein level using an immunofluorescence method. Viral load and levels of LvToll and LvToll in moribund shrimp from co-habitation group were significantly higher than were those of moribund shrimp from YHV-injected group. Survived shrimp from co-habitation group had a significantly lower viral load and lower levels of LvToll and LvToll than the moribund shrimp of the same group. It suggests that mRNA and protein levels in shrimp following an infection by a particular pathogen could differ depending on the route of infection. As the co-habitation method of inducing infection is considered a natural mode of infection, this study also suggests that during natural YHV infection in penaeid shrimp, the up-regulation of LvToll does occur; whether this response is responsible for some degree of protection against mortality caused by YHV infection requires further study. Studies on the physiological responses of shrimp to bacterial or viral infections carried out using experimental infections are usually performed by administering pathogens to the shrimp. The methods of administration have been variable and include allowing the shrimp to swim in water contaminated with pathogens, co-habitation with infected shrimp, feeding shrimp meat from infected shrimp and the direct injection of pathogens into shrimp. The most convenient method of pathogen administration is often injection because doses of pathogens can be precisely controlled but injection is also an unnatural mode of infection. The immersion, feeding, or co-habitation methods are more natural because these conditions are likely to occur in cultured shrimp ponds with disease outbreaks. The injection of pathogens creates a situation in which the shrimp faces a sudden increase in the pathogen and the responses of the shrimp could be quite variable depending on the dose of the pathogen. Shrimp may die as the result of a heavy pathogen load before they can build up their defenses. These considerations are particularly important if pathogens are highly virulent, as White Spot Syndrome Virus (WSSV) and Yellow Head Virus (YHV) are; both viruses can kill the shrimp as early as a few hours after the injection of a high virus dose (Flegel et al., 1995). Low-dose injections usually allow some infected shrimp to survive. One of the innate protection mechanisms of the shrimp that may play a role in preventing death is the synthesis of Pattern Recognition Receptors (PRRs). These proteins bind to certain pathogen components and induce life-saving responses in shrimp, provided that sufficient time is allowed for the whole process to finish. The PRR responses involve a complex range of binding events between ligands and pathogen components, which are followed by intracellular transduction processes (Hoffmann et al., 1999; Soderhall and Cerenius, 1998; Medzhitov and Janewayr, 2002; Loker et al., 2004; Shi et al., 2010). Therefore, if shrimp are injected with a high dose of a virus, they may die before any the expression of PRRs could be detected. In contrast, using a low pathogen dose, shrimp may have time to express PRRs and some of the infected shrimp may survive due to the responses induced by the PRRs. A group of proteins classified as PRRs are the Toll-like Receptors (TLRs). The transcript Toll and the corresponding protein were originally identified in Drosophila melanogaster (Hashimoto et al., 1988) and is known to play an essential role in the recognition of microbes, leading to the induction of antimicrobial peptide expression (Zambon et al., 2005). TLRs and Toll have also been identified in several penaeid shrimp species and have been named LvToll for Litopenaeus vannamei, PmToll for Penaeus monodon, MjToll for Metapenaeus japonicas, FcToll for Fenneropenaeus chinensis and so on (Akira et al., 2006; Arts et al., 2007; Mekata et al., 2008; Yang et al., 2008; Shi et al., 2010; Flegel and Sritunyalucksana, 2011). The defensive roles of TLRs against pathogens in penaeid shrimp have been studied and the results were controversial. Arts et al. (2007) described PmToll in the black tiger shrimp P. monodon and found that the PmToll level did not change after WSSV injection, suggesting that the Toll pathway may not be involved in the defense against WSSV infection. In contrast, Yang et al. (2008) found that injecting the bacterium V. anguillarum into F. chinensis induced the up-regulation of FcToll. Because WSSV is more virulent than V. anguillarum, it is possible that the low virulence of V. anguillarum gives the injected F. chinensis sufficient time to up-regulate its expression of FcToll and subsequently produce TLR proteins that can fight the infection. The shrimp may die or survive the infection but the response in FcToll expression was detected, whereas in case of WSSV injection into P. monodon, rapid mortality occurred before the shrimp had sufficient time to up-regulate the expression of PmToll. Based on the hypothesis that shrimps responses to pathogens depend on how the pathogens are introduced into the shrimp, the expression of LvToll and TLR proteins were assessed in white leg shrimp, L. vannamei, that were infected with YHV using different challenge methods. Animals and experimental plan: Specific pathogen-free L. vannamei juveniles (7-10 g of body weight) were obtained from a commercial farm in Thailand and screened for the presence of YHV using a reverse transcriptase polymerase chain reaction (RT-PCR) kit (IQ2000TM YHV/gill-associated virus (GAV) detection, Farming IntelliGene Technology Co., Ltd, Taiwan); only YHV-free shrimp were used for this study. The shrimp were divided into the following groups: I. control (N = a 20), no treatment; II. YHV-injected (N = a 20), demonstration of YHV by injection and III. YHV co-habitation (N = a 50), exposure via co-habitation with YHV-injected shrimp. The shrimp in each group were stocked separately in one-ton fiberglass tanks; the tank for group III shrimp contained a floating net cage (10x10x10 in) that housed 10 YHV-injected shrimp. All of the shrimp were reared in 20 ppt seawater with adequate aeration and were fed commercial pellets at 3% BW per day. The water quality was monitored (total ammonia nitrogen <1 ppm; total nitrite <1 ppm; pH 8.0-8.3; alkalinity 120-150 ppm; temperature 27-29°C). A YHV solution for use as the inoculum was prepared from the hemolymph of YHV-infected shrimp infected during a natural YHV outbreak. The hemolymph was withdrawn from YHV-infected L. vannamei, filtered through a 0.45 μm membrane, diluted 1:10,000 in lobster hemolymph buffer (LHB) and kept at -80°C until use. Shrimp in the YHV-injected group were injected with 100 μL of YHV solution intramuscularly, in the abdominal segment and the control shrimp were injected with only LHB. All of the YHV-injected shrimp in group II and the 10 individuals in the net cage of group III became moribund and died within 3 days after the injection (Fig. 1). In group III, 40 shrimp became moribund within 14 days of the start of the co-habitation and 10 shrimp were apparently healthy for up to one month. All of the shrimp were collected for study at different times. In group I, 3 shrimp died during the first 13 days and no mortality occurred thereafter. The group I shrimp were collected on day 30 of the experiment. Because all group II shrimp died within 3 days post-injection, moribund shrimp were therefore sampled during the first 3 days. This group was designated the moribund YHV-injected group. Group III shrimp had no mortality until day 7 after the start of cohabitation and mortality reached 80% by day 14. After day 14, there was no mortality until day 30. Therefore, in this group, moribund shrimp were sampled from day 7 to day 14 after the start of cohabitation and these shrimp were designated the moribund YHV-cohab group. The shrimp in this group that survived were additionally sampled at day 30 and these shrimp were designated the survived YHV-cohab group. A shrimp was considered moribund when it was lethargic and lying on its side but moving its appendages and gill filaments. Dead shrimp were not collected for study; thus, great care was taken to distinguish moribund shrimp from dead shrimp. Moribund shrimp were used to allow the maximum time for virus-shrimp interactions to occur; these shrimp might have responded to the YHV infection and any related changes in the expression levels of LvToll and TLRs would likely to be detected. The gills of the control, YHV-injected, moribund YHV-cohab and survived YHV-cohab shrimp were isolated and used to determine the YHV-G2 and LvToll mRNA levels using reverse transcriptase polymerase chain reaction (RT-PCR). YHV-G2 encodes the envelope protein of YHV (Wijegoonawardane et al., 2008); the level of YHV-G2 thus represents the YHV load. The tissue was also studied to determine the levels of TLR expression by immunofluorescence. The gills were selected as a representative tissue expressing lToll and TLRs because the gill tissue is easy to isolate and has been shown to express high levels of lToll and TLRs in the Chinese shrimp F. chinensis (Yang et al., 2008). RT-PCR for YHV-G2 and lToll expression: Total RNA from the gills of individual shrimp was extracted using Trizol (Invitrogen, Carlsbad, USA) and treated with DNase1 (Takara, Ohtsu, Japan) for 30 min at 37°C. The RNA (4 ng μL-1) was reverse transcribed using the Superscript III One-Step RT-PCR kit (Invitrogen, Carlsbad, USA) with TLR-, YHV-G2 and elongation factor-1α (EF-1α)-specific primers (Table 1). The amplification of the cDNA was carried out using cycling conditions of 94°C for 45 sec for the denaturation step, 55°C for 45 sec for the annealing step and 72°C for 60 sec for the extension step. The numbers of cycles were 35, 30 and 20 for TLR, YHV-G2 and EF-1α, respectively. The PCR products were electrophoresed on 2% agarose gel, immersed in ethidium bromide and visualized on a UV-transilluminator. The amplification rate was quantitated using Scion Image for Windows (Scion, MD, USA). The amplification levels of TLR and YHV-G2 for individual shrimp were divided by the corresponding amplification level of EF-1α to obtain the relative expression levels. Cloning of the DNA region encoding the leucine-rich repeats (LRRs) of LvToll: Total RNA was extracted from the gills of the control shrimp using the RNeasy Mini Kit (Qiagen, Germany) and was used as the template for the synthesis of cDNA using Superscript III reverse transcriptase (Invitrogen), oligo (dT) and E. coli RNase H.
The primers lTollF265 and lTollR1380 with added restriction sites were used to amplify the DNA region corresponding to nucleotide positions 265 to 1380 of the lToll open reading frame (GenBank accession No. DQ 923424) by PCR using Pfx polymerase (Invitrogen) and cDNA as the template; this region encodes an extracellular domain called the leucine-rich repeat (LRR) region of LvToll. The PCR product of 1,132 bp was cloned into the Bacillus amyloliquefaciens H (BamH) I and Xanthomonas holcicola (Xho) I sites of the pGEX-6P-1 expression vector, which was then transformed into the BL21 E. coli strain BL21. The integrity of the open reading frame of recombinant the plasmid and of the LRR region of LvToll was verified by DNA sequencing. LRRs of LvToll expression: E. coli harboring the recombinant plasmid were cultured in Lysogeny Broth (LB) to the exponential phase and the expression of the recombinant proteins was induced with 1 mM isopropyl-β-D-thiogalactopyranoside (IPTG) for 4 h. After centrifugation at 4,000xg for 20 min, the bacterial pellet was dissolved in 100 millimolar (mM) NaH2PO4, 10 mM Tris-HCl, 8 molar (M) urea (pH 8) and 1 mM phenylmethylsulfonyl fluoride (PMSF) and then sonicated until a clear lysate was obtained. The lysate was separated by SDS-PAGE with a 10% gel. After staining with Coomassie brilliant blue, a recombinant protein band for the glutathione-S-transferase (GST)-tagged fusion protein and (LRR)-leucine-rich repeat, namely GST-LRR Toll, with molecular mass of 68.5 kDa was cut out and destained until the gel was clear. The gel strips were collected in dialysis bags and the protein was eluted with a transblot apparatus (BioRad) at 70 V for 6 h. The protein solution was dialyzed to eliminate sodium dodecyl sulfate (SDS) and salt before determining the protein concentration using the Bradford protein assay (Bradford, 1976). The protein solution was divided into small aliquots and stored at -70°C. 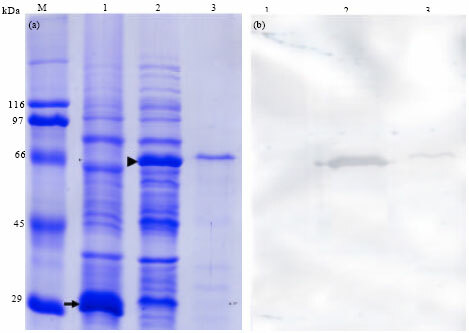 SDS-PAGE, antibody production and Western blot analysis: Lysates of E. coli BL21 harboring the pGEX-6P-1 plasmid, lysates of E. coli harboring the LRRToll-pGEX plasmid and purified GST-LRRToll protein were separated by 10% SDS-PAGE according to method described by Laemmli (1970). Samples were electrophoresed on the gel and stained using Coomassie brilliant blue. The purified GST-LRRToll protein was used to immunize three Swiss mice by intra-peritoneal injection (0.05 mg per mouse) after mixing with Freunds complete adjuvant in a 1:1 ratio. The mice were subsequently injected three more times with the protein mixed with Freunds incomplete adjuvant at two-week intervals. One week after the fourth injection, mouse antisera were collected and tested against the E. coli lysate and the purified recombinant proteins by Western blot. For Western blot analysis, samples resolved by SDS-PAGE were electroblotted onto nitrocellulose membranes using a Transblot apparatus (BioRad) and then incubated for 4 h with mouse anti-LRRToll antiserum. The membranes were then exposed to the lysate of E. coli harboring the pGEX-6P-1 plasmid at a dilution of 1:5000 in 5% Blotto (5% nonfat dry milk, 0.1% Triton X-100 in PBS). After extensive washing in 0.5% Blotto, the membrane was incubated in horseradish peroxidase-conjugated goat anti-mouse IgG heavy and light chain-specific antibody (GAM-HRP; BioRad) at 1:1500 in 5% Blotto for 4 h. The membranes were then washed extensively as before and incubated for 5 min in a substrate mixture containing 0.006% hydrogen peroxide, 0.03% diaminobenzidine (DAB) and 0.05% cobalt chloride in phosphate buffered saline (PBS). The membranes were then washed extensively in distilled water. Immunofluorescence assay: The gills were removed and fixed in Davidsons fixative solution for 24 h before processing for paraffin sectioning. Serial sections were prepared as 8 μm thick using a microtome. Those sections were processed for indirect immunofluorescence staining using mouse anti-LRRToll antiserum at a dilution of 1:5000 for 5 h at 37°C. Sections were incubated with an Alexa Fluor® 546 goat anti-mouse IgG at a dilution of 1:500 in 10% calf serum in PBS for 5 h at 37°C. After extensive washing with PBS, the fluorescence signal was observed with a fluorescence microscope (Olympus BX51). Negative control sections were prepared identically but omitting the antiserum. Statistical analysis: One-way ANOVA with the Student-Newman-Keuls multiple comparison test was used to determine the statistical significance. The data were analyzed using SPSS for Windows, version 16. The RT-PCR for YHV-G2 expression in the gills revealed expression in YHV-injected, moribund YHV-cohab and survived YHV-cohab shrimp but not in the control shrimp (Fig. 2). The relative intensities of the positive bands decreased in the following order: moribund YHV-cohab>YHV-injected>survived YHV-cohab. The relative YHV level of the moribund YHV-injected shrimp was significantly higher (p<0.05) than the levels of the other two groups. The relative LvToll expression in the gills was also significantly higher (p<0.05) in the moribund YHV-cohab group than in the other groups (Fig. 3). Proteins in the lysate of E. coli harboring the pGEX-6P-1 plasmid were separated by SDS-PAGE, which revealed the presence of GST-LRRToll with a molecular mass of 68.5 kDa (Fig. 4a, lane 2). When the band in lane 2 of Fig. 4 was cut out and the protein eluted, high-purity GST-LRRToll was obtained (Fig. 4a, lane 3). This purified GST-LRRToll was used to immunize mice and a polyclonal antibody was obtained. The antibody was used for Western blot analysis of the bands separated by SDS-PAGE. In the Western blot analysis, the antibody exposed to the lysate of E. coli containing GST bound to GST-LRRToll (Fig. 4b, lane 2 and 3) but not to the lysate of E. coli containing GST (Fig. 4b, lane 1). This result suggests that the antibody could bind specifically to LRRToll. This antibody was used for the immunofluorescence analysis of the gills from negative control, moribund YHV-injected, moribund YHV-cohab and survived YHV-cohab shrimp. A baseline level of antibody binding was observed in the negative control shrimp (Fig. 5a), suggesting the presence of GST-LRRToll receptors in the tissue. The level of binding observed for the moribund YHV-injected shrimp was similar to that for the control shrimp (Fig. 5b). In the moribund YHV-cohab shrimp, there was high level of antibody binding, suggesting that there were high levels of GST-LRRToll receptors (Fig. 5c). 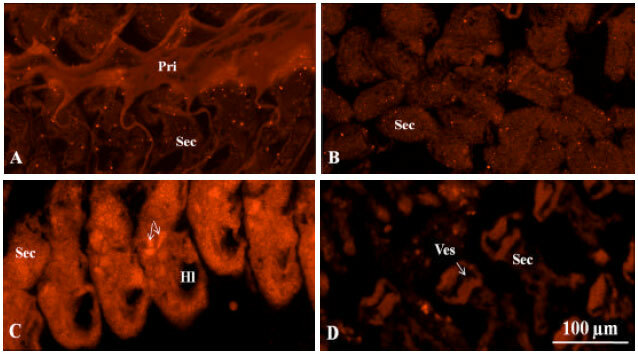 The binding was localized mainly in the area of the secondary gill filaments, where the pillar cells are located. Within the same filament, different staining intensities were observed (Fig. 5c, arrows), suggesting different levels of expression of the GST-LRRToll receptors among different pillar cells. No antibody binding was observed in the hemolymphatic lacuna and in the afferent and efferent vessels of the gills, suggesting an absence or only a low level of GST-LRRToll receptors in hemocytes. In the survived YHV-cohab shrimp, the reaction intensity was between that of the moribund YHV-cohab shrimp and that of the moribund YHV-injected shrimp (Fig. 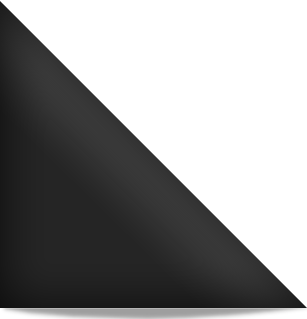 5d). Negative control sections exhibited no reaction (data not shown). This study showed that injecting YHV into L. vannamei, which represent the sudden administration of a certain load of the virus into the shrimps body, killed all of the shrimp within a few days. Using this infection system, the moribund shrimp did not exhibit any significant change in the expression levels of LvToll mRNA or lToll protein in their gills, as shown by RT-PCR and immunofluorescent, respectively. Using a different mode of infection with the same pathogen, a water-borne route (the co-habitation method), 80% of the shrimp survived up to two weeks before succumbing to death and 20% of the shrimp survived for at least one month. Using the co-habitation infection method, the virus slowly entered the shrimps body, replicated and significantly increased in number, with an even higher load found in the gills of these shrimp than in the gills of the YHV-injected shrimp. However, the shrimp had a better chance of survival than the shrimp that were injected with YHV directly. Significantly higher levels of LvToll mRNA and lToll protein in the gills were also detected. It is possible that the higher level of LvToll protein protected the shrimp and allowed them to survive until YHV had replicated to a critical level. The shrimp could not tolerate and this interpretation may be misleading. Therefore, up-regulation of GST-LRRToll, or TLRs might be only one of the responses of the shrimp to YHV infection and might not have the protective function. Better evidence demonstrating that the TLRs play roles in protecting the shrimp would be provided by knocking down the expression of the TLRs using RNA interference technology or other methods. These assays would reveal whether the lToll-knock down shrimp are more susceptible to YHV. Labreuche et al. (2009) and Wang et al. (2010) reported that LvToll-knock down and the shrimps responses to a viral infection have been published but these studies used White-spot Syndrome Virus (WSSV), another highly virulent shrimp virus and not YHV. It turned out that the knock-down shrimp did not show any higher susceptibility to WSSV relative to the control shrimp and the interpretation was that the Toll pathway had no role in the defense of L. vannamei against WSSV. However, in both studies, dsRNA against LvToll did not make the shrimp more susceptible to WSSV infection; on the contrary, it made the shrimp more likely to survive the infection. Although, the LvToll level had been down-regulated by dsRNA in their studies, the shrimp had apparently become more resistant to WSSV. This result suggested that LvToll dsRNA acts as non-specific dsRNA that inhibits the replication of WSSV. Therefore, the interpretation that LvToll plays no role in the defense against WSSV is still not adequately supported. In the same study, Wang et al. (2010) reported that if Vibrio harveyi was used as the pathogen instead of WSSV, the lToll knock down-shrimp became more susceptible and therefore these authors concluded that lToll played role in the protection against V. harveyi. In general, V. harveyi, an important bacterium capable of infecting penaeid shrimp, is much less virulent than WSSV (Flegel et al, 1995). The majority of shrimp infected with V. harveyi either lived for several days before succumbing to death or survived the infection. In contrast, for WSSV infection, the majority of the shrimp died within a few days. It is possible that the prolonged incubation period of infection might allow the shrimp to up-regulate LvToll, resulting in some protection, as observed for the V. harveyi infection. For the WSSV infection, the incubation period is short and the shrimp had no time to up-regulate their lToll expression and died before the rescue by lToll could take place. Above WSSV studies, the mode of experimental infection was injection. Had the infection been transited by co-habitation, in which the slow entry of the virus occurs, then the use of dsRNA to knock down LvToll expression might result in greater susceptibility to the virus, resulting in the opposite interpretation. In addition to the time factor, the induction of Toll in shrimp target cells may also depend on the type of pathogen. In F. chinensis, Yang et al. (2008) found that injection with V. anguillarum induced the up-regulation of FcToll, whereas injection with WSSV induced the down-regulation of FcToll. It is well known that WSSV virions are localized in the nucleus of the target cells, whereas YHV virions remain in the cytoplasm and Vibrio spp. are located outside of the target cells (Flegel et al., 1995). It is possible that the location of the pathogen might influence Toll production. The replication of pathogens in the nucleus, as occurs for WSSV, may inhibit the production of Toll by co-opting enzymes, nucleotides and other components necessary for transcription. In contrast, YHV and Vibrio spp., localized to the cytoplasm and the outside of the cell, respectively, may replicate without interfering with the induction of Toll production. The findings of Yang et al. (2008) suggested that WSSV had already knocked down FcToll; therefore, further knock-down using dsRNA, as performed by Labreuche et al. (2009) and Wang et al. (2010) would not worsen the situation of the target cell to any significant extent. Taking all results into conclusion, it suggests that LvToll regulation is involved in the defense mechanism against YHV in L. vannamei. The present study and those of other investigators lead to suggest that the rate of entry into the target cell and the type of pathogen play important roles in the induction of Toll expression. Whether Toll plays a role in the defense of shrimp against pathogens requires further investigation. This study was supported funds from The Thailand Research Fund (TRF) and the Commission on Higher Education (MRG4980196) provided to RP and funds from the Research Division, Srinakharinwirot University, (Fiscal year 2008) to provided PC. The authors would like to thank Professor Paisarn Sithigorngul, Department of Biology, Faculty of Science, Srinakharinwirot University, for use of the facilities for polyclonal antibody production. Akira, S., S. Uematsu and O. Takeuchi, 2006. Pathogen recognition and innate immunity. Cell, 124: 783-801. Arts, J.A.J., F.H.J. Cornelissen, T. Cijsouw, T. Hermsen, H.F.J. Savelkoul and R.J.M. Stet, 2007. Molecular cloning and expression of a Toll receptor in the giant tiger shrimp, Penaeus monodon. Fish Shellfish Immunol., 23: 504-513. Flegel, T.W. and K. Sritunyalucksana, 2011. Shrimp molecular responses to viral pathogens. J. Mar. Biotechnol., 13: 587-607. Flegel, T.W., S. Sriurairatana, C. Wongteerasupaya, V. Boonsaeng, S. Panyim and B. Withyachumnarnkul, 1995. Progress in Characterization and Control of Yellow-Head Virus of Penaeus monodon. In: Swimming through Troubled Water, Browdy, C.L. and J.S. Hopkins (Eds.). World Aquaculture Society, Baton Rouge, FL., USA., ISBN-13: 9780962452987, pp: 76-83. Hashimoto, C., K.L. Hudson and K.V. Anderson, 1988. The Toll gene of drosophila, required for dorsal-ventral embryonic polarity, appears to encode a transmembrane protein. Cell, 52: 269-279. Hoffmann, J.A., F.C. Kafatos, C.A. Janeway Jr. and R.A.B. Ezekowitz, 1999. Phylogenetic perspectives in innate immunity. Science, 284: 1313-1318. Labreuche, Y., N.A. O'Leary, E. de la Vega, A. Veloso and P.S. Gross et al., 2009. Lack of evidence for Litopenaeus vannamei toll receptor (lToll) involvement in activation of sequence-independent antiviral immunity in shrimp. Dev. Comp. Immunol., 33: 806-810. Loker, E.S., C.M. Adema, S.M. Zhang and T.B. Kepler, 2004. Invertebrate immune systems-not homogeneous, not simple, not well understood. Immunol. Rev., 198: 10-24. Medzhitov, R. and C.A. Janeway Jr., 2002. Decoding the patterns of self and nonself by the innate immune system. Science, 296: 298-300. Mekata, T., T. Kono, T. Yoshida, M. Sakai and T. Itami, 2008. Identification of cDNA encoding Toll receptor, MjToll gene from Kuruma shrimp, Marsupenaeus japonicus. Fish Shellfish Immunol., 24: 122-133. Shi, X.Z., X.C. Li, S. Wang, X.F. Zhao and J.X. Wang, 2010. Transcriptome analysis of hemocytes and hepatopancreas in red swamp crayfish, Procambarus clarkii, challenged with white spot syndrome virus. Invertebrate Surviv. J., 7: 119-131. Soderhall, K. and L. Cerenius, 1998. Role of the prophenoloxidase-activating system in invertebrate immunity. Curr. Opin. Immunol., 10: 23-28. Wang, K.C.H.C., C.W. Tseng, H.Y. Lin, I.T. Chen and Y.H. Chen et al., 2010. RNAi knock-down of the Litopenaeus vannamei toll gene (LvToll) significantly increases mortality and reduces bacterial clearance after challenge with Vibrio harveyi. Dev. Comp. Immunol., 34: 49-58. Wijegoonawardane, P.K.M., J.A. Cowley and P.J Walker, 2008. Consensus RT-nested PCR detection of yellow head complex genotypes in penaeid shrimp. J. Virol. Methods, 153: 168-175. Yang, C., J. Zhang, F. Li, H. Ma and Q. Zhang et al., 2008. A toll receptor from Chinese shrimp Fenneropenaeus chinensis is responsive to Vibrio anguillarum infection. Fish Shellfish Immunol., 24: 564-574. Zambon, R.A., M. Nandakumar, V.N. Vakharia and L.P. Wu, 2005. The toll pathway is important for an antiviral response in Drosophila. Proc. Natl. Acad. Sci. USA., 102: 7257-7262.